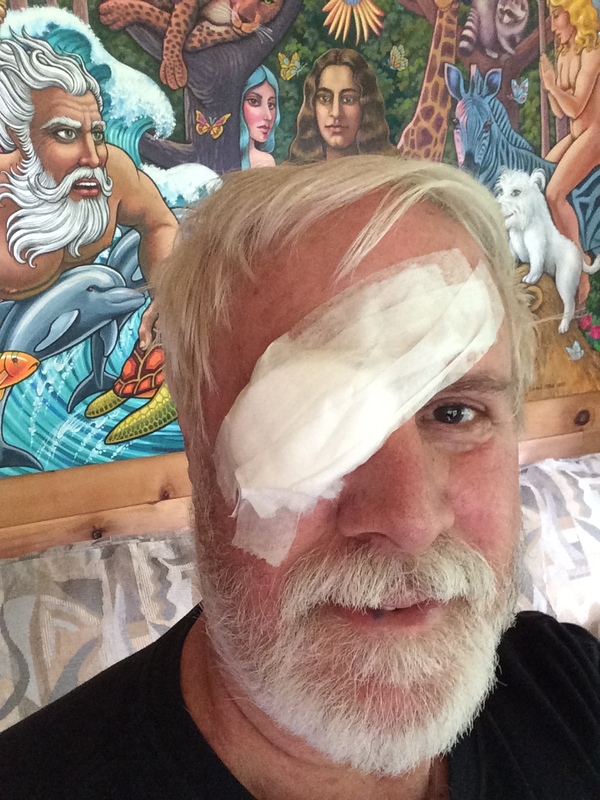 I was amazed to feel as good as I did 24 hours after my epiretinal membrane peel eye surgery. Minutes after taking this photo I removed the bandage. At first my vision was blurry, but three days after surgery I could see better than I did the day before surgery, and my eyesight will improve in coming weeks and months. Life is a school and daily events are lessons in how to live better. Some weeks serve up whole courses, employing some rather unique instructional approaches. Then there are those days when you get sent to the principal’s office. That was the case with my eye surgery last Friday. On Tuesday I visited retina specialist Dr. Roy Brod in Lancaster, PA, to evaluate the status of my macular pucker — extra epiretinal membrane tissue growing over my right retina and progressively obscuring the vision in that eye. He had told me three years ago that we would need to wait for the right time to do surgery — when the unwanted tissue was massive enough to remove, but before it was too well established. 1. Motivation: Last Tuesday Dr. Brod finally said, “It’s time.” He had a cancellation in his Friday surgery schedule. We’d have to hustle through some preliminary lab tests and forms, but I could have the slot if I wanted it. I said “yes,” and three years of hypothetical dread of eye surgery became suddenly sharp and clear. I said “yes,” because my vision was getting so bad that It was affecting my ability to work, make art, drive, negotiate stairs, and engage in daily activities. I may be 65, but I don’t feel finished yet. I’m not done working or making art or doing all sorts of normal activities. I cherish my vision as much as everyone else does, and that is sufficient motivation to sign up for surgery. But now I had to figure out how to survive the actual dreaded cut and peel procedure, especially since I would be awake for it. How was I going to hold still and be a good patient? Hell! How was I going to avoid bolting and running screaming out of the operating room? Nobody can abide the thought of sharp objects near or in their eyes, and I am no exception. It seems to be a primal fear, like falling or being eaten by wild animals. I suppose humans have been accidentally poked in the eye by sharp sticks throughout our history, and that collective memory grosses us out — every one of us. We have even turned this ancient fear into a childhood chant. When we want someone to make an excellent promise we require them to repeat: “Cross my heart and hope to die! Stick a needle in my eye!” The threat of a sharp object in the eye is sufficient to enforce any difficult commitment. But I had signed on for the dreaded poke deliberately and voluntarily, and I knew I was going to need more than just the motivation of better vision to get me through it. 2. Trust and Confidence: It was clear to me from the start, that you have to trust the guy with the sharp stick or there’s no hope. The “eye principal,” Dr. Roy Brod, is the best of the best in his field. Everyone says so. Along with a few bona fide saints, he is one of the most respected individuals I have ever encountered in any field. And he’s an incredibly nice guy. He’s just so amazingly kind to everyone. You can’t help wishing he lived next door. He’s a prince of a man who inspires confidence and trust with every look and word. And his touch is almost magical. When he gently places a hand on your shoulder or brow, you feel instantly comforted and strangely at peace. This quality is essential in someone you are going to trust with sharp objects close to and in your eyes, believe me. 3. Great Drugs: Nevertheless, I strongly recommend that you make damn sure there is a wonderful anesthesiologist with miraculous drugs at hand, whenever you go into surgery. They hooked me up to an IV and pumped God knows what into me throughout the procedure — a sedative? — a mood elevator? I don’t know… but whatever it was it worked. AND they totally knocked me out for the two minutes it took them to administer shots directly into my eye, so I was not awake for that choice moment, thank goodness! The rest of the time I felt so calm that I had NO trouble holding still, and I was basically just fascinated by the whole process, including the visuals, like a good movie playing right inside my retina. I’m so grateful for those great drugs, because I was awake and could see the entire procedure. I was watching the needle-fine instrument when its tiny jaws opened and grabbed the largest piece of my extra epiretinal membrane tissue to peel and pull it away and out of my eye. I was quite calm and intrigued, and my only thought was, “There goes my problem!” When Dr. Brod administered iodine drops I was mesmerized by the beautiful swirling magenta patterns in my field of vision. And when it was all over I realized that it had been a walk in the park. 4. Support of Friends: Oh sure… It’s a picnic when it’s all over, but what about the suspense beforehand? How do you deal with the adrenalin surges every time you realize, “Oh my God! I’m having eye surgery in two days!” How do you cope with the terror associated with eye torture when you wake up in the middle of the night and can’t go back to sleep? I decided to tell people about my surgery, not because I needed the world to know, but because I wanted as much moral support from the positive thoughts, prayers and hopes of friends and loved ones as I could get. And it worked! I could really feel it powerfully. It helped so clearly that the day before my surgery, even without any drugs, I was already flying. My profound thanks to everyone who said a prayer or sent me a positive thought. 5. Attitude Positioning: The day before surgery I decided that this procedure was a cosmetic luxury afforded only to the rich (people with some means, Medicare and supplemental insurance like me) who happen to be living in modern times. As such, it seemed to me that it was like going to the spa for a professional massage, shampoo, haircut and facial. I adopted that attitude. I was there to be pampered, and I remained in that frame of mind throughout. When Dr. Brod entered the operating room I was blindfolded, but I raised my hand and said, “Thank you for coming to my party!” He laughed and said, “Yes! Let’s have a great party!” I really like Dr. Brod so much. He is so generous with everyone. That helped with my “spa pampering” attitude positioning. Dr. Brod was my personal masseur and spa master who was there to spoil me and make me feel special and wonderful. 6. Surrender: From that attitudinal perspective it was easy to lie back and relax. Living in the woods, I have noticed that when the animals are dying or in dire situations, they surrender and become still and quiet. They let go. I thought often in the few days prior to my surgery about specific animals I have witnessed in these kinds of situations and how deeply instructive their behavior was. I decided to imagine that my circumstances were much more dire than eye surgery — What if I were scheduled to be unfairly executed in the morning? What attitude would I want to adopt in that case? I thought of other dire cirumstances. When I returned to the reality of eye surgery, it did not seem so difficult or frightening after all. This is my 4 x 7 ft oil on canvas, “Poseidon’s Prophecy,” in progress. I’m looking forward to getting back to work on it with improved vision. 7. Divine Intervention: But I still had one ace up my sleeve, and the day of the surgery was the time to play it. Much of the time before, during and after the procedure, I managed to chant to the Divine Beloved, and to think of five very saintly individuals I have been so fortunate to meet or know in my lifetime. I called upon them to stand with me. This was very calming, reassuring and helpful. I was especially aware of one of them holding my right hand where the IV was inserted. Whenever I was tempted to feel afraid or stressed, I focused on The Infinite Beloved in the forms of these five saints, and was at peace instantly. The stress left my body and I became pyscially relaxed and still. My brother, Dr. Chris Miller, picked me up after the surgery. Dr. Brod called him to say that the procedure had gone extremely well and that I had been a perfect patient — didn’t move a muscle. Chris was very kind to me and allowed me to rest quietly in his beautiful garden or sleep in his recliner. He made us a fantastic lunch — grilled vegetable and fried egg sandwhiches on whole grain toast. Yum! Then Chris took me back as Dr. Brod had requested for a post-op evaluation six hours after the surgery. The doctor was so excited when he analyzed the results of his own work that he was almost jumping up and down. He said, “Just for the fun of it, let’s take some more images. I won’t charge you for them. It would just be so interesting to compare the images immediately before and after surgery.” He was so pleased with the pictures that he said he might write a paper about my case. 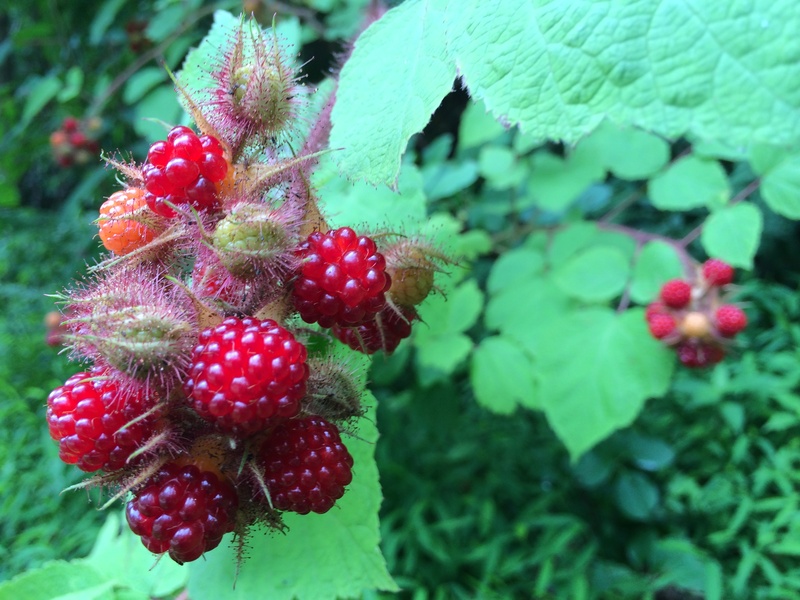 We have a bumper crop of berries on our 12 acres this year, and I was relieved when Dr. Brod agreed to allow me to pick them. 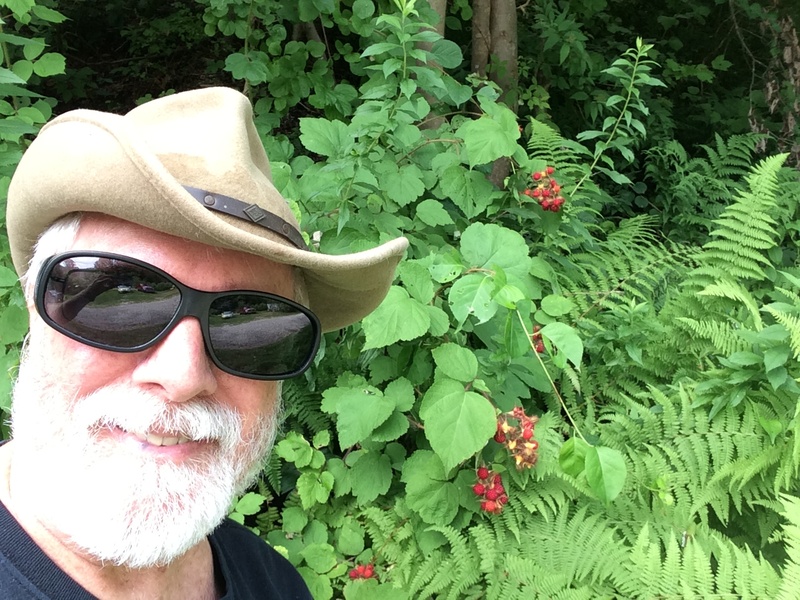 I wore big sun glasses to protect my eye from thorny berry branches and glaring sun, as I picked a half-gallon of ripe berries two days after eye surgery. I have not had one minute of discomfort through this entire experience. The doctor wrote me a prescription for a heavy duty pain killer and said that I would very likely have to use it to get through the pain that would eventually come. But there has been no pain whatsoever. Well… okay… I did have a few moments of rather exquisite pain yesterday when I was picking berries two days after the surgery. I unknowingly stepped on the home of a colony of ground-dwelling bees. They swarmed and five of them stung me on my right arm within five seconds. Now THAT hurt! It hurt infinitely more than anything I experienced during eye surgery. The bee strings made me realize that sometimes the pain we think we feel is imaginary. We feel it whether it really is painful or not, just because we perceive the circumstances to be hurtful — like a needle in the eye — because of how awful it looks or seems. When I analyzed the actual pain of the bee strings, as opposed to the perceived pain, that wasn’t as bad as I had thought either. In fact it was entirely gone within minutes, and a few hours later there was no sign of the very understandable assault by the poor bees against whom I had trespassed. Today, just three days after my epiretinal membrane peel eye surgery, I can already see much better than I did the day before the procedure. And Dr. Brod has assured me that my vision will continue to improve for several weeks and months. I am excited to discover how much of my original visual acuity might return and to experience what that will mean when I am working, making art, driving and just living daily life. I am deeply grateful for this opportunity, and aware that not so many decades ago it would not have been possible. I would have gone nearly blind in my right eye and coped as best I could with one remaining eye. A close-up view of this summer’s berries. Life is a school, and I learned some important lessons in this Course on Vision: I learned that it isn’t just Dr. Brod’s incredibly steady hands that make his practice so successful, but also his obvious joy and pleasure in his chosen vocation. That intrinsic love of his work inspires confidence in his patients and insures positive outcomes. I also learned that there are at least seven tactics that patients can adopt to help doctors perform successful surgeries, but more importantly, those same tactics can be applied for a more rewarding life in general. Well… okay… when it comes to #3, “Great Drugs,” at least in my case, this is primarily about my ongoing efforts to moderate my morning tea and evening cocktail intake… and come to think of it, that really is quite important. So all seven of these principles apply to life in general, for me anyway. Another week… another course in the School of Life… another step closer to clear vision. By the way, in case you were wondering, attendance is compulsory in the lessons and courses offered by the School of Life, until graduation, when we shall see all things clearly. Until then our job is to be attentive students. Don’t be afraid to challenge the authorities and ask really hard questions. When the opportunity presents itself, be generous and offer to help others with their studies, especially if they are struggling or fear they may even be failing. Finally, the wise student will pause regularly to express private inner gratitude for the invaluable and rare opportunity to learn and progress in this School of Life. 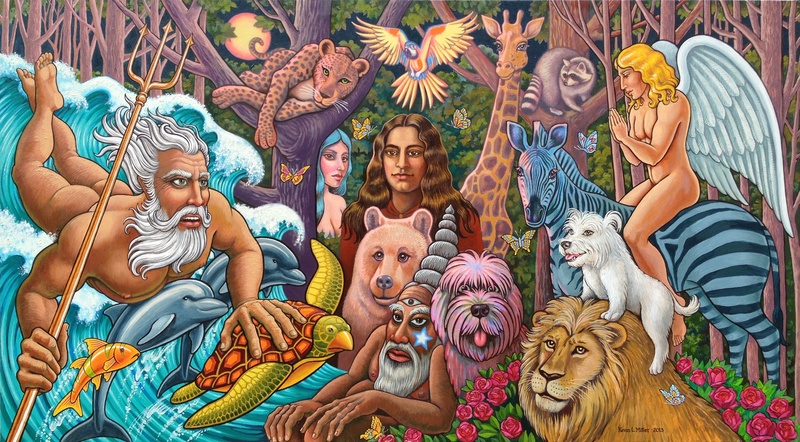 This entry was posted in Art, Life, Nature, Science, Spirit, Wisdom and tagged art by Kevin, Dr. Roy Brod, epiretianal membrane peel surgery, macular pucker surgery, overcoming fear and dread, Poseidon's Prophecy, preparing for surgery, retinal surgery, surviving eye surgery by paulmichaell. Bookmark the permalink. Peter, I already have my 60-year-old parrot, Dolly, who would love to sit on my shoulder all day and complete the impression created by an eye patch. So, if this retinal surgery thing doesn’t work out, I have an option! Sorry that you had to go through this, but am very happy that all is ok, and thanks for all the directives! They are very useful in case anyone has to have the same surgery. Dear Kevin, I have recently been diagnosed with epiretinal membrane. I found your blog post by way of a search on this condition. Like you, I am an artist and, judging by your picture, about your age. I would like to know how your vision is two years after your surgery. Thank you. Be well. Hi Linda, look at us–waking up this two year old thread. Please keep us posted on your progress. I don’t know when I’ll have the surgery, probably late this year or early 2017. Best wishes.